User account settings are accessible from the Profile page. Clicking your name in the lower-left corner of the Toggl toolbar brings up a popup box. Click on "Profile Settings" to manage your account. To receive tips and suggestions from Toggl tick the relevant box. Please note that unchecking the box won't stop all emails. For example, emails related to payments will continue to be sent. Tick the weekly reports box to enable an automated email that is sent every first day of the week. This feature respects the "First day of the week" option you set on the Profile page. Enable the long-running email notification if you want to be reminded about timers that have been running for over 8 hours. When enabled, similar entries will be grouped under one entry on the Timer page. Actions can done over all entries at once or by expanding the group and editing each one. Grouping is only available on the Timer page (not in Reports). Controls the running timer notification in your browser tab. We suggest turning this off if you have a hearing accessibility tool enabled. From the Profile page you can opt-in to a program that will give you early access to all new features being introduced to the Toggl webapp. Click on the green "Enable beta features" button to get started. For a bit more details on the program open the following blog post. This setting affects the behavior in Reports. The Timer page works by using your your device's (phone/computer) time. We suggest keeping these in sync. 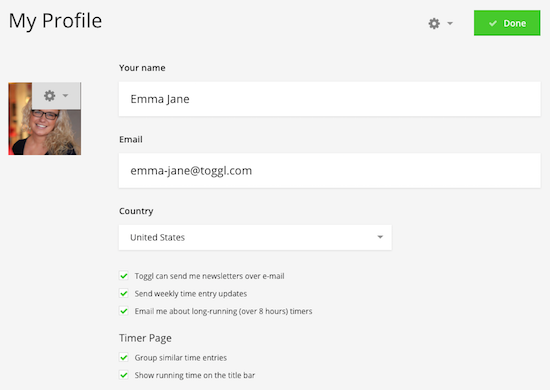 Time and date format: Affects how time and date are displayed in all Toggl apps. Duration display format: Select how durations are displayed in Toggl apps. Due to UI limitations in some apps, we recommend avoiding the "Classic" option. First day of the week: Tweaking this setting will change the calendars in Toggl as well as the day on which your weekly report email is sent. Can't close the account? 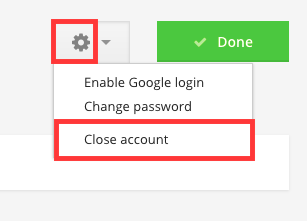 Open the "How to close my account" article, it contains details on limitations that prevent an account from being closed.